� 2010 Charlesworth et al; licensee BioMed Central Ltd. This is an Open Access article distributed under the terms of the Creative Commons Attribution License (http://creativecommons.org/licenses/by/2.0), which permits unrestricted use, distribution, and reproduction in any medium, provided the original work is properly cited. Background: This investigation offers insights into system-wide pathological processes induced in response to cigarette smoke exposure by determining its influences at the gene expression level. Methods: We obtained genome-wide quantitative transcriptional profiles from 1,240 individuals from the San Antonio Family Heart Study, including 297 current smokers. Using lymphocyte samples, we identified 20,413 transcripts with significantly detectable expression levels, including both known and predicted genes. Correlation between smoking and gene expression levels was determined using a regression model that allows for residual genetic effects. Results: With a conservative false-discovery rate of 5% we identified 323 unique genes (342 transcripts) whose expression levels were significantly correlated with smoking behavior. These genes showed significant overrepresentation within a range of functional categories that correspond well with known smoking-related pathologies, including immune response, cell death, cancer, natural killer cell signaling and xenobiotic metabolism. Conclusions: Our results indicate that not only individual genes but entire networks of gene interaction are influenced by cigarette smoking. This is the largest in vivo transcriptomic epidemiological study of smoking to date and reveals the significant and comprehensive influence of cigarette smoke, as an environmental variable, on the expression of genes. 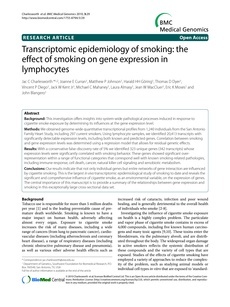 The central importance of this manuscript is to provide a summary of the relationships between gene expression and smoking in this exceptionally large cross-sectional data set.